Raipur, May 21: We are always fond of the areas where we live, in other words, we are always well experienced in our own soil. Keeping this in mind Chhattisgarh will have their much awaited ‘Bastariya Battalion’ of CRPF to carryout Anti Naxal operation’s (ANO) in the region. One of the important features is that it will have 33 % reservation for the women constable. Union Home Minister Rajnath Singh commissioned the maiden anti-Naxal 'Bastariya' battalion of the Central Reserve Police Force (CRPF) in Raipur today. “Naxal forces do not want these areas to develop as they very well know that if development takes place their sinister plan will never succeed,” says Minister Singh while addressing the event. “Establishing Bastariya Battalion was a well thought of decision of the central government as we knew that people from scheduled tribes have an immense sense of patriotism and national pride in them” he further added. The ‘Bastariya’ jawans will be deployed in the core area to add teeth to the anti-Naxal operations of CRPF in the Naxal-infested Bastar division of Chhattisgarh. Numbered 241. 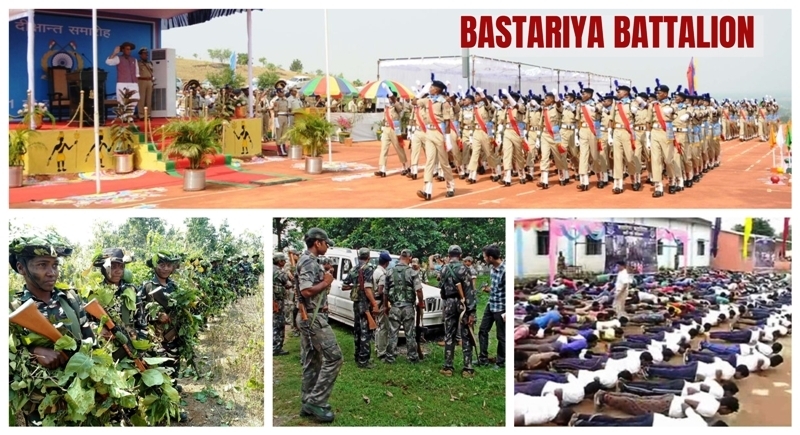 This new battalion of CRPF carries the moniker ‘Bastariya Battalion’ for the special reason that it comprises of youths, mostly scouted from the four highly Naxal infested Bijapur, Dantewada, Narayanpur, and Sukma districts of Chhattisgarh. A total of 534 candidates including 189 female recruits underwent specialized training at ATC Bilaspur and ATC Ambikapur spanning over 44 long weeks. The training included guerrilla warfare, camouflage, living off the land and all those tricks of the trade that involve jungle operations. These jawans, after the PoP, will be deployed in the core areas of Chhattisgarh to fight the Naxals alongside the normal GD Bns and CoBRABns of CRPF. To enhance the local representation in the battalion the govt erased the physical standards and wrote the new one specially for this battalion as the physical standards of height and weight were relaxed to give a fair chance to the local aspirants, CRPF also walked yet another extra mile to provide pre-educational and physical training to the local youths through Civic Action Programmes so as to maximize their ability and eligibility for induction into the special formation. Armed with about a year’s rigorous training and so many years of geospatial experience of their own soil, these combat-ready jawans of CRPF are all poised to switch from their training ground to the battleground in Bastar.